Many of you have been so kind to inquire about my healing progress and prognosis. I continue to be overwhelmed by your kindness and prayers. Many have also inquired as to what exactly was done. 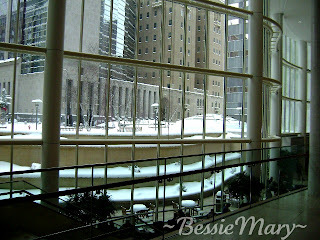 So, I will attempt to share a little about our recent trip, the Mayo Clinic, and my surgery. 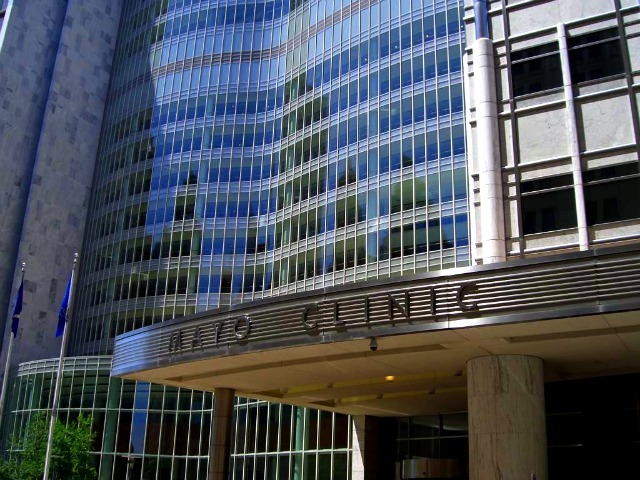 The Mayo Clinic has long been a part of our family's history. I just never expected to be a patient! My mother-in-law, Dorothye, was raised in Janesville, Minnesota. After graduating from University of Minnesota, she moved to Rochester and began working as a medical secretary at Mayo. Through her experience there, she would begin a career with the American Urology Association. My father-in-law trained in urology at the Mayo. Years later, through their connections with the American Urology Assocation, they would meet and marry. However, they both always retained strong ties professionally and personally with Mayo and members of its staff. 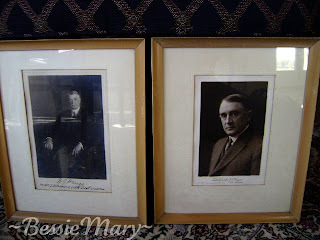 At one time, it was evidently quite the thing for medical doctors to gift each other with autographed portraits. These photographs of the Mayo brothers, bearing inscriptions to my father-in-law, normally reside in our attic, along with boxes of similar photographs which once graced the walls of his Memphis medical office. While in Rochester, we discovered the Mayo brothers also had an extensive collection of autographed photographs. At least their families have the many Mayo campus buildings in which to display their collection, and the many clinic visitors with which to share! Our attic does not normally receive many visitors. 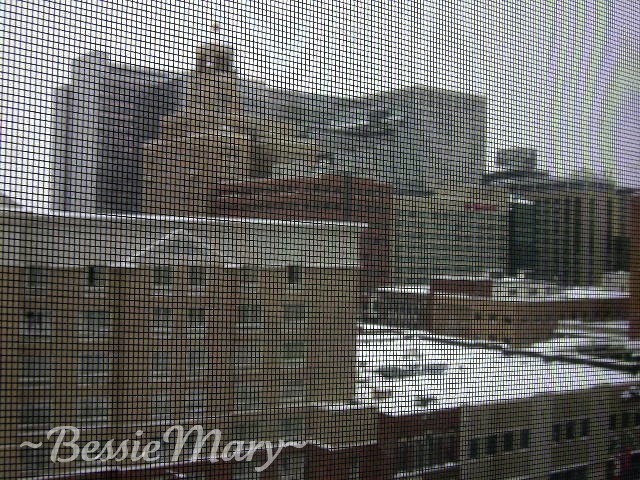 This was the view from our hotel window during both of our recent visits. 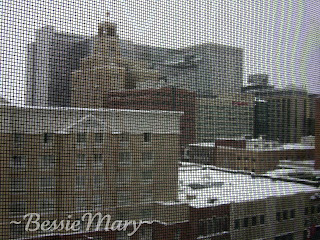 Pardon the poor image caused by the window screen. Buildings comprising the Mayo Clinic campus are those farthest away. The tallest buildings are the Gonda and Mayo Buildings. Directly in front of them, the tall beige building with the tower is Plummer Building. The tower is ornately decorated with stone carvings of griffins, gargoyles, dragons and owls. A pair of nurses adorns each corner of the tower. The tower houses the Rochester Carillon comprised of 56 bells, making it one of the largest instruments of its kind in North America. Carillon concerts, lasting 20-30 minutes, are performed three times weekly. In order to hear the music, it is best to be outside. Unfortunately, at the time of concerts, I was either in my hotel room, undergoing tests, or at appointments. Hopefully, on our next trip, schedule and weather will allow more time to enjoy the carillon. 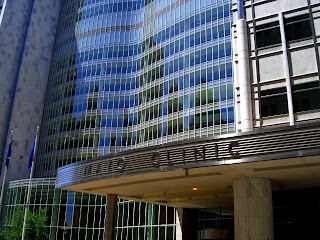 This photograph, which I shared in a previous post, shows the main entrance of the clinic into the Gonda Building. Immediately inside is Admissions and Business Services, where most patients first report. I must say that we hardly ever stood in line, or waited more than a few minutes for appointments or scheduled meetings. Regardless of where we went, we were greeted quickly and warmly. Even when we arrived early for appointments, they were often prepared for us. Truly amazing, compared to the time we have spent waiting in other doctor offices and hospitals the past two years. Across the lobby from Admissions is the Slaggie Family Cancer Education Center. Just outside its doors is a very large installation by Dale Chihuly. 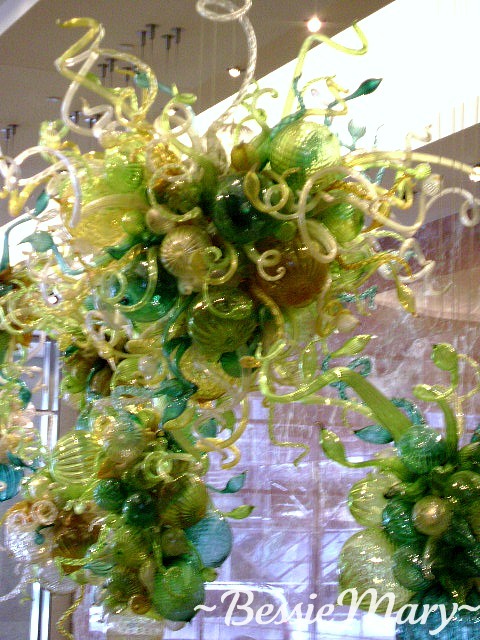 Thirteen "chandeliers" of blown glass weighing 6,000 pounds comprise this incredible creation. Chihuly decided not to title this piece. He wanted to create something that makes people feel good, and did not want them influenced by any title or other association. 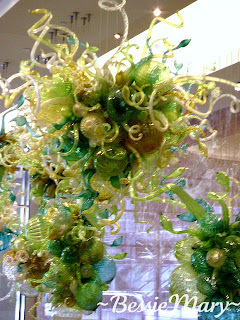 It especially seemed fitting for our visit -- its many shimmering glass spheres and tendrils resembled Christmas tree ornaments and tinsel. The piece was a gift from Serena Fleischhaker in honor of her husband and grandparents. 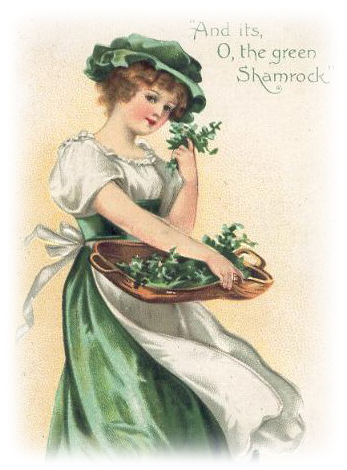 The Mayo is actually home to many beautiful pieces of art by well known artists. These are the towering windows on the front of the Gonda Building, and immediately left of the main entrance doors. When I took the photograph, I was standing in front of Admissions. 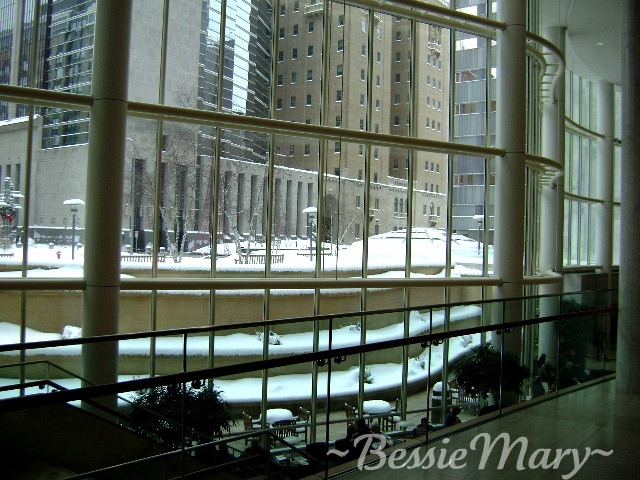 Looking outside the windows, you may spy one of the snow laden tables which appeared in this post. Wide marble steps lead down from the Gonda lobby to the Nathan Landow Atrium. The large windows from the previous photograph flood this area with light. In the center of the photograph, is a grand piano. You can click on the photograph to enlarge, and will see patients gathered round the piano in their wheelchairs. Throughout the day, someone would be playing. Sometimes it was a volunteer, filling the space with holiday music or other tunes. Other times, it might be a patient sharing their talent and temporarily forgetting their pain or problems. Anyone is welcome to play. It was always the intent of the Mayo brothers to serve all needs of a patient's body and soul. On the wall is Man and Freedom, a cast bronze (1954) by Ivan Mestrovic. It once hung on the exterior of Mayo, but has been relocated to this spot. It is described as a powerful depiction of the human desire for independence and self-realization. The entrance to the subway, linking our hotel to the clinic, is directly to the left and bottom of the statue. 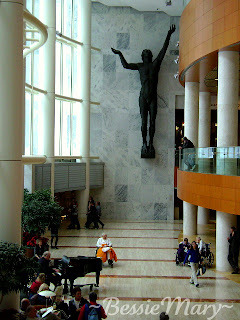 To reach the elevators to my surgeon's office, we always exited the subway and walked beneath the feet of this great statue. This photograph also holds special meaning to me. As I snapped it, I just happened to catch the young medical student who took a great interest in my case. Since my condition was different from many, there were often medical students and other observers gathered in my surgeon's office during appointments and examinations. This time, I did not mind being a source of interest. If this young man is able to go forth and help others with this condition, it is a blessing. The subways are a series of corridors linking many hotels, restaurants, retail shops and other businesses with the Mayo. It is strictly pedestrian traffic -- no vehicles of any type. There are many wheelchairs, but that is the only other means of transportation seen within the subways and skywalks. In one portion of the subway, we would also pass this display. Throughout the buildings, there are displays of items linked to the Mayo family or medical practice. 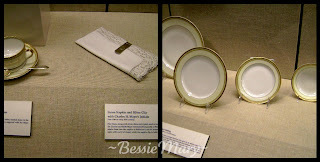 This is a display of Mayo family china. One day, prior to surgery, I especially had some time to study it. In the crowds and unfamiliar territory, I became separated from my husband. With my helter-skelter vision, I could only wait patiently for him to retrace his steps and find me. The linen lace-trimmed napkin especially caught my attention. Its folds are held with a silver napkin clip, engraved with Charles Mayo's initials. I collect antique silver napkin rings, but was not familiar with antique silver napkin clips. The Mayo is a learning place for more than just medical information! 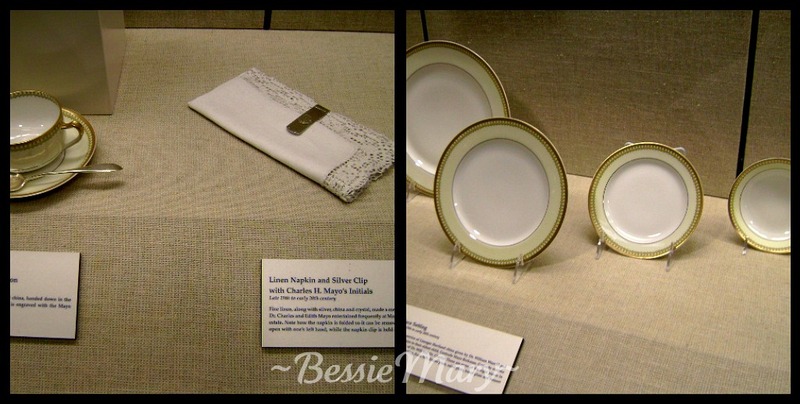 Within this same display, but not photographed, are also pieces of presidential china sets. Many US presidents and vice-presidents have been treated at the Mayo over the years. Some of them have also shared pieces of china and other items with the Mayo. When I saw the vintage marble water fountain and decorative elevator doors, I was immediately taken back in time to the downtown office building of my childhood doctor. Mostly, I realized how rare it is to see drinking water fountains! Unfortunately, this fountain has met modern times. The bubbling mouthpiece no longer offers its cool refreshment. A spigot has been added above for the filling of water bottles or cups. 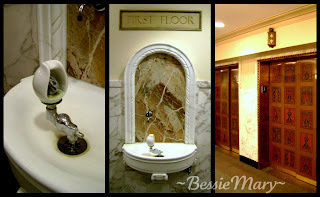 This fountain and these elevators are located in the Plummer Building. I will be back soon with more photographs and details! What wonderful photos and interesting facts. I love the autographed photos and the images of china and other personal items. I'm so looking forward to more!